There are at least seventeen reasons we like Mercedes-Benz here at Torque News. It’s because they offer 17 high-performance vehicles with over 500 hp that will keep you grinning. But is it only about power with these performance cars? Mercedes-Benz is one of the most progressive automakers in the world and they do it through smarter engineering, engines with smaller displacement and turbochargers. And in the case of the SLS AMG Electric Drive, there is no engine at all. Here are eight Mercedes-Benz cars, wagons and SUVs that will keep you grinning and why we love the brand. We’ll start with the most unlikely car to pump out 577 grocery-hauling hp. It’s the E63 AMG S-Model 4MATIC “superwagon.” It has a sprint time of 0-60 mph in just 3.6 seconds. This is the fastest wagon on the planet. 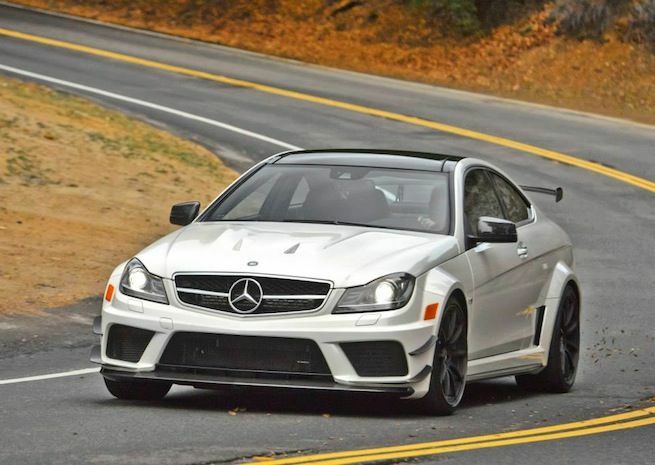 Our favorite is the Mercedes C63 AMG that Mercedes calls a “bruiser”. Their team in Affalterbach created the C63 AMG Black Series and made a bona fide street fighter. When you see those flared wheel arches and its jutting jaw looming in your rear-view mirror on the Autobahn, it would be a good idea to let its 510-hp go on by. Mercedes also took the brilliant C63 AMG and fit it with lighter pistons and connecting rods, gave it special brakes and wheels and a performance exhaust. What do you get? The C63 AMG Edition 507, a 507-hp Coupe that also comes in a Sedan. The 622-hp SLS AMG Black Series is really just a SLS AMG GT3 racecar with license plates. It’s the fifth Black Series model from Mercedes and the most extreme version yet. It’s the fastest SLS in the history of the company. Here’s another grocery hauler that will carry seven people in luxurious comfort and it can smoke many sports cars off the line. It's the 550-hp GL63 AMG. What else could a family want? How about power and refinement? The all-new 2014 S63 AMG 4MATIC has both and sends 577-hp and an astounding 664 lb-ft of torque to all four wheels. Power is one thing, but few vehicles can deliver it with the S63’s refinement. Last but not least on the list of 500 plus hp sports cars is the world’s most powerful production electric vehicle, the SLS AMG Electric Drive. It uses motors at all four wheels putting out a combined 740 horsepower and 738 lb-ft of torque. Now that’s electrifying performance. We have to mention the all-new 2014 CLA45 AMG that has the world’s most powerful turbocharged four-cylinder series-production engine. It doesn’t have over 500 hp, but it comes with an incredible 355-hp and 332 lb-ft of torque coming from just two liters of displacement. Now that’s impressive. Mercedes tells us that regardless of size or type of engine, each vehicle they make must deliver the sort of performance that keeps you grinning. That’s why we cover Mercedes-Benz so extensively here at Torque News. Check back often to find out about the other ten models with 500 plus horsepower. Watch 2013 Mercedes-Benz C63 AMG Coupe Black Series - 2013 Lightning Lap - LL3 Class - Car and Driver video.